I HAD SO MUCH FUN BEING INTERVIEWED BY THE MARVELOUS NORAH COLVIN. CHECK IT OUT AND LET ME KNOW WHAT YOU THINK! Hit the readilearn link, below. Congratulations, Pamela! It’s so gratifying to have our writing acknowledged. And what an excellent testimony! What a great interview, Pam, and I loved seeing some of Shelley’s illustrations. So, you became a writer at age 3! Ha ha. I could just picture the scene you described. It’s wonderful to see this dream come true for you after so many years. Are there more children’s books in your future? Oh good, Pam… so, you’re already thinking about the next one. Yes, I’ve read Grumpy Ana to Tornado Boy. 😀 Now that it has pictures he likes it. Before it was boring. Such honest critics at that age. I enjoyed reading your answers to the interview questions. Your book sounds delightful, just like you. I applaud you for reading that long interview. I (obviously) couldn’t edit myself. So much to shout out about creativity, writing, seeing the joy in the eyes of my students when they discover their own writing magic. And tooting my own horn, too, I admit, shame-faced. :-0 Many many thanks for being a blogging buddy. Wonderful interview, Pam — I read it and left a comment. I can’t wait for the next visit from my grandson so I can read him your book! It’s right here waiting for him. Thanks, Mike. You’re one of my first blogging friends, did you know that? The support over the years (gad, that makes us sound ancient) has meant the world to me. I am? That makes me kinda proud! I left a comment over on the interview, but I’m not sure it went through, so I’ll repost it here. Wonderful interview. Fun to learn more about you. It’s great you get so much writing done early in the morning. Must make for such a sense of accomplishment the rest of the day. You are the best, Carrie. Your comment came through on both sites. Yes, for me, I find that I’m totally energized first thing in the morning. By 9:00, when many people are just getting to work, I’ve gotten in 3 hours of writing/editing/preparing for classes, etc. After exercise breaks etc, I come back in the early afternoon to read bloggers’ posts and learn. If I don’t get 500-1,000 words in for the next novel I’m writing, I feel rather let down by the end of the day. Do you go through that also? I do. Sometimes I don’t get those words written until ten o’clock at night, but I still rest easier if I know they’re written. Wonderful that you made your dream come true Pamela. I enjoyed reading the interview very much. Wishing you a great weekend! A lovely review of Birds of Paradise which was interesting and inspiring. 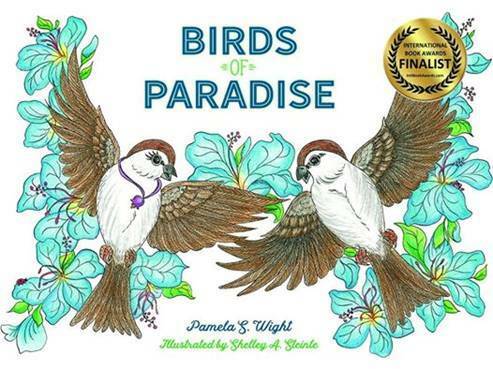 Birds of Paradise is an excellent book, liked by children as well as adults. Someday you must finish those half finished novels. Don’t wait too long though and get busy. You have WordPress readers who are waiting to read another good book. I loved this interview, Pam, and it was wonderful to learn more about you. This book is beautiful and looks very special. I’ll be checking this out for me and for my grandsons. I love what you said about never running out of ideas. Your attitude of abundance is refreshing in a world where fear of scarcity abounds. I credit my ability to write to all the many books I’ve read, so I totally agree that if you want to write you need to read, read, read, read! I’m also thrilled to know your are a New Englander! I’d love to meet you some day. I’d love to meet! I’m close to Boston – are you in Maine? We could probably talk hours and hours about the books we’re reading….and writing! Maybe we can meet halfway some time. If you are ever in southern Maine let me know. I have a feeling we would not lack for conversation, Pam! I love how your grandson describes his Madre’s accomplishments. Congratulations, Pam. What a great interview! Great – heading over there now! A wonderful tribute to you and your writing. I enjoyed reading this. I know what you mean. WordPress needs a “Love” button. I’m in flight! Thanks, David. Thank you for reading the whole darn long interview. Norah asked me such great questions, I couldn’t stop! Congratulations on your delightful-sounding book, Pam! What a wonderful and insightful interview and testimony to your book, as well. I loved reading how you began as a writer, and also what you’ve accomplished. I look forward to reading your book (books). Many thanks, Lauren. SO happy we’ve connected. I look forward to reading more of your dreamy poems and prose. What a great interview, it was fun learning more about you. I love reading your blog and your books. Exactly! Perhaps, for writers, it’s like preferring to write our stories with pen on paper, instead of fingers on keyboard. Many thanks for reading this interview – great questions from Norah.